ANYWAY: not only does this yearly change proceed into a great shift in weather, the need to wear socks or even shoes for that matter, but a rather noticeable drop in available produce, including all of my very favorite varieties. The top of this list, of course, would be tomatoes. I'm not talking about the barely pink, mealy versions that you bought at your grocery store out of the refrigerated (gasp!) case. Oh, no. I'm talking mountains and piles of sunny golden heirlooms, green and purple and deep maroon lovelies, teeny-tiny lemonade hued pearl versions that are sweeter than any other summer fruit. It kills me to know their days in my kitchen are numbered. So what to do with so many tomatoes? Though they're perfectly edible as is, and I've been known to go teeth-deep as if they were an apple, I always hate to see food, especially such good food, spoil for lack of ways to use it. However, if we've been learning anything from the large bounty of goods our CSA has provided us this summer, it's the value of our freezer space (which houses not much more than ice cubes and a few burritos, for those particularly lazy occasion) and possibly purchasing some beautiful blue canning jars. Those are going to end my life, in the best possible way. Of course, the very best thing to do with softening, sugary ripe tomatoes is to turn them into a beautiful marinara sauce. You can use a few ladlefuls tonight, over pasta or sautéd vegetables, and store the rest for the winter, for some snowy night in February when you'll think, gosh, it'd be nice to have some sauce with this. Oh, wait! Ha to the ha, because the joke is on all of us. What you need is relative, and very much in tune with what else is floating around your kitchen or fridge at the time. While I will fill you in on what I used in this particular batch, I will also let you know that it has very far strayed from this combination, sometimes to include zucchini, chopped peppers, kale, chard or even white beans. Why not? In a large pot on medium heat, add your olive oil, onion and garlic. 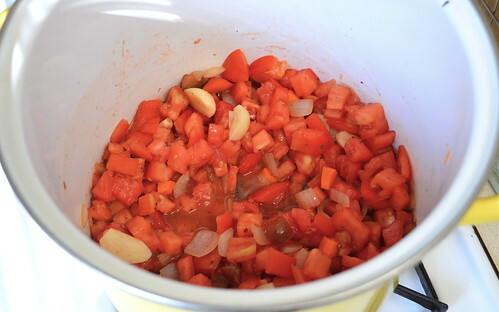 Get the aromas floating around and stir frequently for about 3-4 minutes. The onions should start to soften and the garlic should break apart a bit. 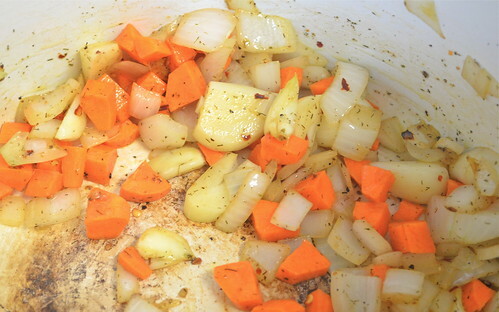 Add your carrots and continue to stir. Add some salt, pepper and crushed red pepper. I tend to add less in the beginning, knowing that more can always be added later. The thing about crushed red pepper, however, is that the sooner you add it into the recipe, the more the flavor will intensify over cooking time. So just a little bit will go a long way. 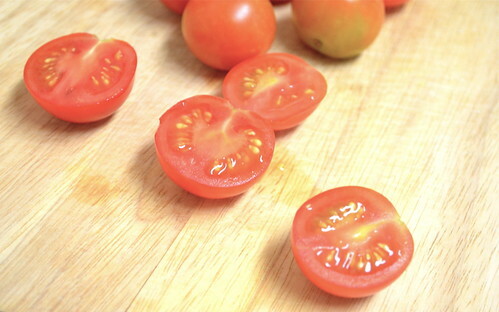 Add your tomatoes and, after about 1 minute, as you notice they are starting to break apart, add your balsamic vinegar. (Now is also a good time to add a touch more olive oil, should you feel that it's necessary.) 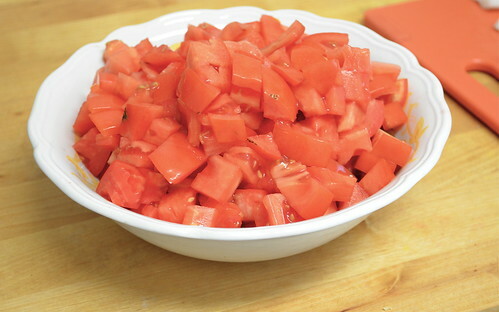 Stir until mostly softened and your tomatoes have begun to liquefy. Reduce heat, cover and simmer for however long you want. Yes, it's true. The beauty of this sauce lies in its flexible ingredient list AND cook time. The great thing is this sauce can be considered "ready" whenever you are. Do you have lots of time on your hands, things to do around the house, mail to sort through, September issues to browse? Go ahead, lounge, read, nap (well), etc. This sauce has nothin' but time. It will continue to sweeten and deepen in flavor the longer you let it simmer, so try a few different timeframes and see how the flavor varies and decide what you like best. As for me, I let this pot of goodness simmer for nearly four hours. FOUR HOURS. I must be crazy, but I figured I'd make this a long race instead of a short one. (Get it? Sprint? Marathon? You get it. You do.) A few minutes before you turn off the heat completely (and be sure to give it a solid stir every now and again to ensure nothing is too sticky), add your fresh basil. You don't want to add fresh herbs too early on in the cooking process, otherwise their delicate flavor can get too muddled. Turn off the heat and allow to cool for about 20-30 minutes. 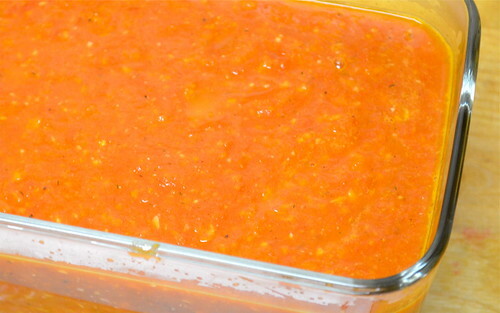 Then, using a handheld blender, gently purée your sauce until it is mostly smooth. A few good chunks always add to the experience, I say. If you only have a regular countertop blender, you can still complete this step by adding your sauce in small batches, mixing and returning to the pot. So there you have it. Sauce in a flash or sauce in an hour (or more), this version is slightly sweet with a hint of vinegar tang and perfect for saving, jarring and sharing with friends. Warning, though: Once you do this, there's no going back to the jarred stuff. Though, let's face it, were you ever really there in the first place?